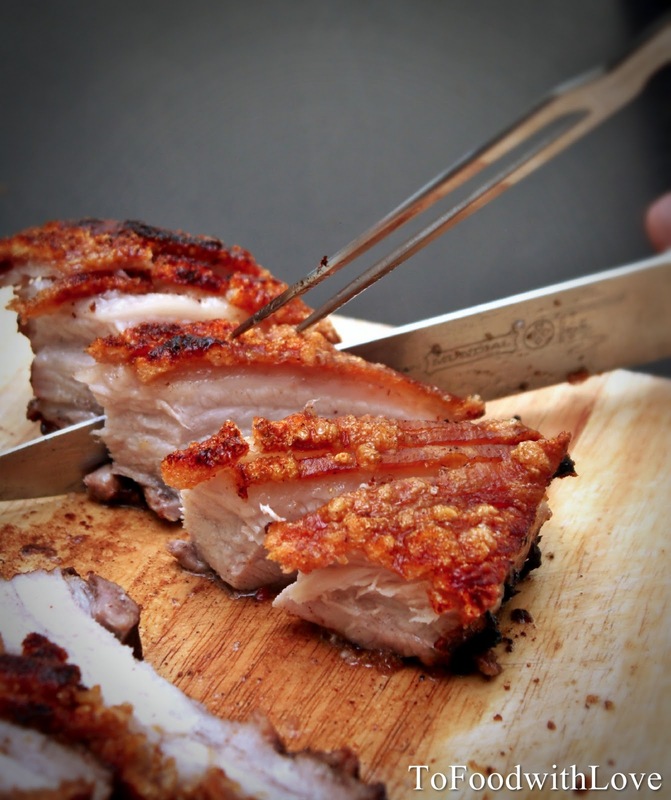 I came across a beautiful piece of pork belly roast at the supermarket last weekend and couldn't resist buying it. And so last night, I decided to have some "fun" making crispy pork belly, and for the first time too! Intially, I was a little apprehensive because I wasn't sure if I would get the crackling nice and crisp. But hey, it really wasn't that difficult! Even G was surprised I managed to pull this one off so easily! The meat was moist and tender, balanced with perfect layers of fat in between. The crackling was super crisp and tasty, exuding a rich burst of "lardy" flavour with each crunchy bite. Boil some water in a pot with 2-3 teaspoons salt, and place the pork in the boiling water, making sure it is totally submerged. Boil uncovered for 30 minutes. Remove and drain on a wire rack. Pat dry with a paper towel and leave for about 20 minutes to dry out. Score the skin vertically with a knife, about 1/2 cm apart. Make sure it cuts through to the fat, as this will allow the fat to render. Rub about 1/2 tbsp of salt over the meat and skin. Combine marinade in a bowl and rub all over the meat (but not the skin). Place in the fridge uncovered for 4 hours or overnight. Preheat oven to 180C. Rub a little salt over the skin. Place on a wire rack skin side up, and pour about 1-2 cups of water into the roasting pan so that it steams the meat in the oven. Place the pan in the middle rack in the oven and roast for 1 hour. Increase temperature to 220C and roast for another half hour or until skin starts to brown and sizzle. Turn on the grill/broiler on high to crisp up the skin, which should begin to bubble, crackle and pop! When it starts to char, and the skin is evenly crisped all over, remove from oven and let it rest for about 10-15 minutes before slicing/chopping into pieces (you can scrape off the blackened charred bits first using a knife). Best to use a chopper to do this, if not, a regular chef's knife is fine too. Serve with vinegared chilli sauce or sriracha. Thanks for a wonderful recipe, it turned out great! I'm happy to hear that! Thanks for your feedback! I can't wait to try this out. This already making me drooled!!!" Thank you for this tempting recipe.